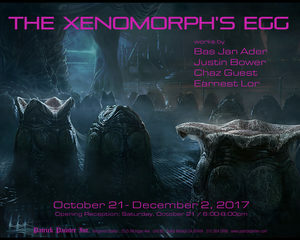 Patrick Painter Inc. is pleased to present The Xenomorph’s Egg, a group exhibition featuring artworks by Bas Jan Ader, Justin Bower, Chaz Guest and Earnest Lor. Bas Jan Ader was born in 1942. Ader mysteriously vanished in 1975 when he set sail on what was to be the smallest sailboat ever to navigate the Atlantic Ocean. He was in the process of completing the third part of the project In Search of the Miraculous. Now, more than 30 years after his disappearance at sea, he is more influential than ever before. 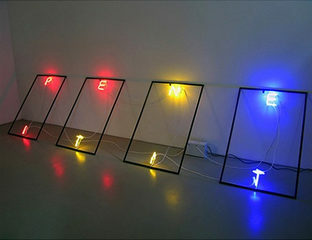 His works are shown all around the world, his most recent exhibition being at the Simon Lee Gallery in London, UK and Metro Pictures in NYC. 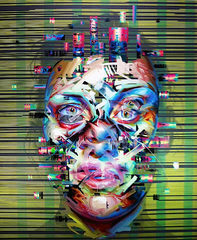 Born in San Francisco in 1975, Justin Bower earned a degree in Art and Philosophy from the University of Arizona in 1998 and a Master of Fine Arts from Claremont Graduate University in 2010. Since graduating from CGU, Bower’s work has been the subject of solo exhibitions at Ace Gallery Beverly Hills and Unix Gallery in New York City. Born 1961 in Niagra Falls NY; Chaz Guest is the seventh of nine brothers and sisters. After earning a Bachelor of Science in Graphic Design from Southern Connecticut State University, he then graduated from the Fashion Institute of Technology in New York. After graduating, Chaz moved to Paris, France. He worked for the fashion magazine Joyce, where he illustrated the lines for various haute couture houses. Guest has exhibition worldwide at many prestigious galleries. Earnest Lor is an American artist born on January 19th, 1991 in Montecito, California. He attended the Think Global School in New York City. Students travel to different countries, which exposes them to diverse cultures. This is where he picked up his belief in Animism, the oldest religious belief in the world that predates paganism. Animism is the belief that there is life in all things. This is Lor’s second exhibition at Patrick Painter Gallery.